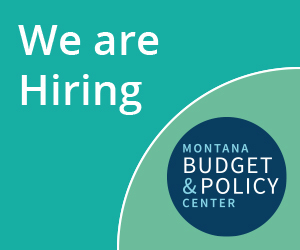 These next few weeks, MBPC will be sharing more information on how the recent budget cuts are impacting Montana families and communities. It’s important to remember that the cuts that we face as a result of the special session in November are on top of cuts that were taken during the regular session and additional cuts triggered this summer. These cuts impact nearly every part of state government from K-12 education to water monitoring. However, the Department of Public Health and Human Services (DPHHS) has taken some of the deepest cuts. If you are wondering what the general fund cuts that the legislature and governor have made, below is a helpful chart. This chart, which was provided by DPHHS, shows only the cut to state general fund dollars. Cuts to health and human services almost always come with a loss in federal funds. One example is Medicaid. For every dollar a state spends on Medicaid services, the federal government matches that dollar with $1 to $2, depending on the exact program. So when we talk about budget cuts, it’s important to include the loss of federal funds, because that compounds the loss of services for seniors, people with disabilities, and low-income families across the state. It’s hard to calculate the exact amount of federal funds Montana will lose, since the legislature doesn’t always proactively reduce the federal appropriation. But when the legislature cuts general fund dollars, the state no longer has the authority to spend those federal funds, regardless of whether they are appropriated or not. We do know that the $49 million in general fund cuts taken during the special session also resulted in a loss of about $60 million in other funds, mostly federal dollars. Factoring in even a conservative estimate for federal matching dollars, the general fund cuts taken this year would likely put the total loss of federal funds for the current biennium at over $100 million. When we total general fund cuts and loss of federal funds, we are quickly reaching over $200 million in cuts to services funded through DPHHS. Over the course of the next few weeks, we’ll share more information on what these cuts mean for our families and neighbors across the state, as well as the nonprofit organizations and local service providers that are feeling the increased pressure and terrible consequences of cutting services for their clients. We collectively must continue to tell policymakers that these cuts cannot stand. Legislators must work with the governor to find a more responsible path forward that will restore a responsible budget that meets our communities’ needs.